So this topic has been covered a bit here and there. A search reveals some scattered info about the possibility that an E-series Ford 9" might be workable in the vans, with changes needed to the spring mount, the driveshaft, AND bolt-pattern changes. I think I recall one or two other swaps as well, but not a lot of hard data. Then there's $$ custom axles. I'd like to revisit what we know and see if I can't beat this problem. To be clear, my primary goal is to be able to fit a selectable locker. A stronger rear axle would probably also be nice, but given that I intend to remain stock in the power department, my only concern over strength comes in the form of damage during wheeling, particularly in low-range. Within that list (and elsewhere, after looking), I see a couple of different sources for a Wide-Track Dana 44 (65", 66", or 69" wide), with a Passenger-side offset. Additionally, these seemed to be available in a 6 on 5.5" bolt pattern, which suits my 2003 just fine. I see conflicting posts here about whether our axle is 66" or 68" (probably down to where the measurement was taken), but those look suitable, right? These will all be drum-brake rears, but I have found aftermarket kits for junkyard calipers, or perhaps some adapters might allow reusing stock calipers. Obviously I won't know anything for sure until I get a tape on an example and compare widths and offset to my van, but this seems like another possible source for a swap. There's still the matter of spring perches and possibly driveshaft interface, but at least the bolt pattern matches for the 2003-2005 vans, which is "one less thing". Anyone see a flaw in my logic? Now I just need to locate a source! This is in respect to Jeep swaps, but definitely identifies a range of Passenger-offset Dana 44s with a 6x5.5 bolt pattern. An update, with some good news/bad news. My other thread about finally pulling the trigger on a re-gear prompted the question "Are you sure you don't want to beef up the rear axle? ", and it's fair. I thought I'd re-visit the question once more. Did some more research, and even paid the $3 to wander around my local pick-your-part with a measuring tape and a notebook. 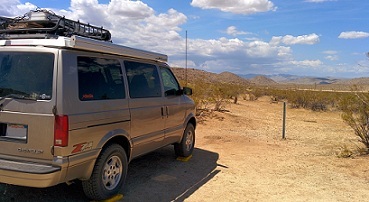 1) Others have mentioned the Explorer as a possible axle source. The only ones my yard had to look at were all 60" wms-wms and 5-lug. Don't seem wide enough for Astros and definitely not ideal for us 6-lug guys. 3) Honda Passport is 6-lug and close at 63-1/2" wms-wms, (and discs) but they're coil sprung, so it looks like it'd be a LOT of work to get things working for the Astro. This was super exciting. As far as I can tell, they're a Chrysler 9.25". Some of the hard-core guys bag on the c-clip nature, but otherwise they seem to have a reputation for being fairly stout, comparable to a Ford 9" or D60, from what I've read. The bummer bit is this: Apparently this isn't a super popular rear-end for off-roading, as nobody makes a selectable locker for this one either. >:( There are the usual selection of Detroit, No-slip, etc., but ARB, Eaton, etc. don't list the 9.25" chrysler in their application catalogs. Given that there'd be a fair level of effort to get a Durango axle to mate with an Astro/Safari, I'm not sure it's worth it for my application. Someone looking for a more stout axle may be happy to have this info though. For myself, I'm probably sticking to the plan of just re-gearing and doing a No-Slip. If it goes boom, then I'll come back to this thread and eat crow. I know this is an old and probably dead post, but did you ever look at the 6 lug Silverado axles from day ‘03 to ‘06 ish? I did some junk jard sleuthing myself this week and here’s what I came up with. Outside leaf spring to outside leaf on the Silverado is 51 and 1/8”. 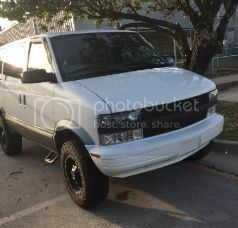 The Astro van is roughly 52 and 1/4”. That was surprising to me that the Astro had a wider spring stance. But here’s the kicker, both axles from backing plate to plate was roughly the same 60.5”. The backing plates and park brake hardware between the two look identical. I’m not sure what the pumpkin offset is though. I picked up the Silverado axle and plan to roll it up under the van to see if things line up. I know for a fact already spring perches will need to be cut off and moved outboard a little, no biggie. Also, a new driveshaft will have to be made up with larger U-Joints due to the larger yoke on the Silverado axle. Thanks, @Herbie, for the scoutwork. For my 1997 SLE, I'm looking long-term at dropout-type full-floats with unequal-length shafts and tubes to match the stock powertrain offset to starboard. The 9" Currie, which introduced major improvements long after Ford Motor Company discontinued 9" production in favor of the Visteon 220, is a strong enough option for all except serious 4x4'ers on pre-2002 models, and Currie Enterprises offers Explorer stock-replacement rotors as four-wheel-disc prep. I'm planning on Superior spindles riding Timken tapered rollers on the axletubes, with the shafts using a 5-on-2-3/4" bolt pattern on the flanges. The 10.5" Torq 14 is even stronger, using the first-gen American Axle 1050 ring and pinion (as introduced on the GM large 14-bolt integral-carrier full-floats), and my recommendation for all 2003-05 models as it'll take the C1500 rear discs. After I've completely derailed the other thread about gearing changes for the OEM axle, I thought I'd try to bring some of my axle thoughts back over here. Can someone remind me the full list of reasons why I shouldn't be looking at the Express/Savanna 1500 8.6 10-bolt rear axles? Is it the offset? Or the width? I'm having trouble getting hard data about whether or not the Express/Savanna have the passenger-side offset or not. Some sources seem to show the width is pretty close WMS-WMS, but even that I have to take with a grain of salt until I can find one and put a tape on it. As far as I'm aware, the Express (except City Express) and Savana use the same centerline propshafts as all General Motors C/K/R/V pickups and chassis-cabs and G-series vans and chassis-cabs. General Motors had a bit of a shoehorning problem in the M-body that the powertrain offset to starboard solved, but that also complicates aftermarket upgrades to the Astro and Safari such as my 9" Currie dropout full-float contingency.